Semidiagrammatic view of a portion of the mucous membrane of the tongue. Two fungiform papillæ are shown. On some of the filiform papillæ the epithelial prolongations stand erect, in one they are spread out, and in three they are folded in. Taste buds contain the taste receptor cells, which are also known as gustatory cells. The taste receptors are located around the small structures known as papillae found on the upper surface of the tongue, soft palate, upper esophagus, the cheek and epiglottis. These structures are involved in detecting the five elements of taste perception: salty, sour, bitter, sweet and umami; through the combination of these elements we detect "flavors." A popular myth assigns these different tastes to different regions of the tongue; in reality these tastes can be detected by any area of the tongue. Via small openings in the tongue epithelium, called taste pores, parts of the food dissolved in saliva come into contact with the taste receptors. These are located on top of the taste receptor cells that constitute the taste buds. The taste receptor cells send information detected by clusters of various receptors and ion channels to the gustatory areas of the brain via the seventh, ninth and tenth cranial nerves. On average, the human tongue has 2,000–8,000 taste buds. Fungiform papillae - as the name suggests, these are slightly mushroom-shaped if looked at in longitudinal section. These are present mostly at the dorsal surface of the tongue, as well as at the sides. Innervated by facial nerve. Foliate papillae - these are ridges and grooves towards the posterior part of the tongue found at the lateral borders. Innervated by facial nerve (anterior papillae) and glossopharyngeal nerve (posterior papillae). Circumvallate papillae - there are only about 10 to 14 of these papillae on most people, and they are present at the back of the oral part of the tongue. They are arranged in a circular-shaped row just in front of the sulcus terminalis of the tongue. They are associated with ducts of Von Ebner's glands, and are innervated by the glossopharyngeal nerve. The fourth type of papillae the filiform papillae are the most numerous but do not contain taste buds. They are characterized by increased keratinisation and are involved in the mechanical aspect of providing abrasion. Salt, sweet, sour and umami tastes causes depolarization of the taste cells, although different mechanisms are applied. Bitter causes an internal release of Ca2+, no external Ca2+ is required. The bud is formed by two kinds of cells: supporting cells and gustatory cells. 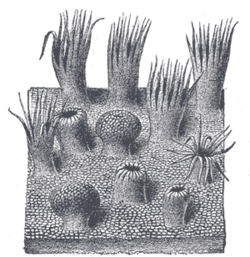 The supporting (sustentacular cells) are mostly arranged like the staves of a cask, and form an outer envelope for the bud. Some, however, are found in the interior of the bud between the gustatory cells. The gustatory (taste) cells, a chemoreceptor, occupy the central portion of the bud; they are spindle-shaped, and each possesses a large spherical nucleus near the middle of the cell. The peripheral end of the cell terminates at the gustatory pore in a fine hair filament, the gustatory hair. The central process passes toward the deep extremity of the bud, and there ends in single or bifurcated varicosities. The nerve fibrils after losing their medullary sheaths enter the taste bud, and end in fine extremities between the gustatory cells; other nerve fibrils ramify between the supporting cells and terminate in fine extremities; these, however, are believed to be nerves of ordinary sensation and not gustatory. 1 2 Shier, David (2016). Hole's Human Anatomy and Physiology. New York: McGraw-Hill Education. pp. 454–455. ISBN 978-0-07-802429-0. ↑ Encyclopædia Britannica. 2009. Encyclopædia Britannica Online. http://kidshealth.org/kid/talk/qa/taste_buds.html For kids about taste buds!